When Barney Hubbs came to Odessa in 1926 to start a newspaper most folks assumed he would go broke. After all, nobody in their right mind would try to get into the newspaper business in a little cow town populated by only 750 residents. Others had tried and failed. That same year, "Josh" Cosden struck oil a few miles southwest of town but it would be two years before Odessa experienced its first oil boom. When Barney arrived, Odessa had a drug store, a grocery store, a bank, one restaurant, a movie theater and no newpaper. But that didn't deter Barney, he know what it was like to be broke. His family had lost everything when their cattle ranch went under in 1908. Barney grew up in Pecos where he got ink in his blood. In these years, Pecos was twice as large as Odessa and had two newspapers. He befriended Billy Leeman whose father owned the Reeves County Record. Barney worked for the Record before and after school and during vacation learning how to set type in the printing office. A few years later, the Record merged with the Pecos Times and Barney worked for them. 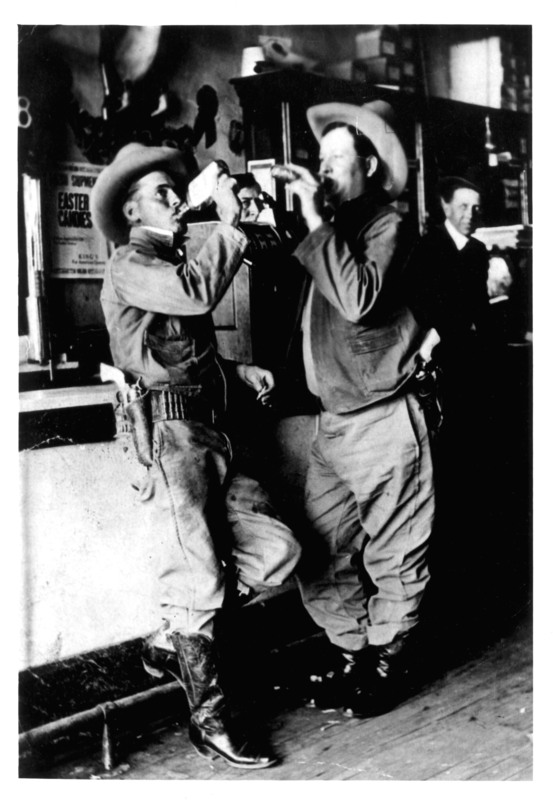 After serving in the U.S. Navy in World War I where he worked on a newspaper in France, Barney returned to Pecos hoping to get his old job back. But the Times had no openings. So he found a job in the oil fields building wooden derricks for a while. One of the wooden derricks he built now sits on display in the Monahans City Park. In 1921, Barney opened a print shop in Pecos and started publishing the Pecos Gusher to compete with his former employer. His venture prospered and in four years he bought out the Times and merged the two newspapers. In the process of the merger, he acquired more printing equipment than he needed. Henry Webb, manager of the Odessa Chamber of Commerce, knew Barney had spare newspaper equipment and convinced him to start a newspaper in Odessa. Previously, a string of Odessa newspapers had come and gone including the Odessa Weekly, The Times, the Ector County Democrat, and the Odessa Herald. Going broke with a newspaper was nothing new in Odessa. At first Barney didn't have time to transport his printing gear to Odessa. 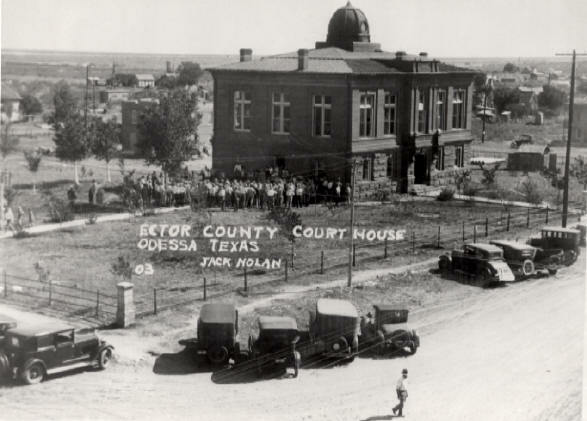 Since he only one Linotype machine, he printed the Ector County News in Pecos before hauling the papers to Odessa in the wee hours before the heat of the day. The trip took four hours because of the deep, drifting sand that covered the road at Monahans. Within a few months, Barney changed the name of the newspaper to the Odessa News. He hired Ruby Webb, wife of Ector County Sheriff Reeder Webb, along with Mrs. Tom Harris to write for the paper. Odessa got its city charter in 1927 and started collecting taxes. The town had hundreds of lots with delinquent tax bills and Barney agreed to print tax sale notices in the paper in exchange for the lots that hadn't sold. It proved to be a profitable venture. He became the owner of some 100 lots up and down Grant Street with an average tax bill of about $12.50 on each lot. He sold one lot at 3rd and Grant for $25.00 to George Elliot who who built a three story brick hotel that is remembered as an Odessa landmark before it was torn down in 1983 to make room for a new police station. Barney did well enough off the sale of the lots to build a new printing office on two lots just east of the Ector County Court House. Rivalry between Odessa and Midland existed even then. In recalling his newspaper experiences in Odessa, Barney told me in a 1991 interview that "Midland always looked down on Odessa as a stepchild in those days. Midland was regarded as a high-collared bunch and we were the poor boys over in Odessa, but it was friendly". When the Midland newspaper came out with a story announcing that the City of Midland had passed an ordinance outlawing the parking of oil field trucks on the streets of Midland, Barney saw an opportunity to promote Odessa. The Odessa News ran a special edition inviting oil field trucks to park anywhere they wanted to in Odessa. Barney distributed 5,000 copies of this edition. By 1928 Odessa had grown considerably but Pecos called Barney home. He decided to sell the Odessa News because his family lived in Pecos. Barney found a buyer for the paper by the name of Frank P. Files. He sold the newspaper on credit with an escrow agreement that if Files missed a payment; the title reverted back to Barney. Then he ran into a political disagreement with the buyer. When Odessa's first mayor, Sam McKinney, tried to get re-elected, he found no support from Frank Files. Files supported a "newcomer" for mayor. Barney made an enemy of Frank Files when he went to Odessa to bolster Sam McKinney's campaign. McKinney won the election. Not long after that, Files defaulted on his note and Barney Hubbs found himself in search of a new owner for the newspaper. Barney then sold the paper to Abe Whipkey from Colorado City. Whipkey wanted to his son Bob, and son-in-law, Rush Moody, into business. In later years, Bob Whipkey became editor of the Big Spring Herald. When the younger Whipkey and Moody had a falling out, they simply walked away from the Odessa newspaper. Abe Whipkey called Barney and told him he simply couldn't meet the payments and turned the newspaper back to him. Business in Pecos prevented Barney from running both newspapers so once again he searched for someone to take over the Odessa operation. Barney called Ralph Shuffler, a long-time newspaperman in Olney who had sold his paper and asked him if wanted to get back into the newspaper game. Shuffler accepted the offer and operated the Odessa News for several years before tuning the business over to his son. Henderson Shuffler ran the paper until 1945. In the 1930s technology gave birth to a new competitor for the small town newspaper, when broadcast radio stations became reality. Until 1935, there were no radio stations between Fort Worth and El Paso but Barney changed that on October 23, 1935 when KIUN went on the air in Pecos. In Midland KRLH, later known as KCRS, began broadcasting two months later. This was the beginning of the Cactus Broadcasting network. Barny's first radio stations were primitive affairs. He hired engineers to build the transmitters. He fabricated radio towers out of drill-stem pipe, a considerable feat of West Texas ingenuity. To build the towers, Barney welded together 200 feet of drill-stem pipe, painted it, and installed warning lights before raising it, "like my dad used to raise windmills with a gin pole". A group of government engineers working in Pecos at the time to install a water system said it couldn't be done and stood in amazement as Barney raised the tower into the air. A short time later, a national engineering magazine published a story that the impossible had taken place in Pecos. Texas. In 1946 Barney introduced broadcast radio to Odessa when KRIG went on the air. Barney's Cactus Network grew to include Pecos, Fort Stockton, McCamey, Alpine; Cortez, Colorado; Lyman, Utah and Tejas, New Mexico. When I interviewed him in 1991, Barney was 95 years old. In spite of his advanced age, he continued to spend several mornings a week at his desk in the Pecos Enterprise building on South Cedar Street in Pecos. His office was simple and unpretentious. On the walls hung photographs, newspaper articles and other mementos collected over the years. Barney sought no praise; he was a humble man in sprite of his many accomplishments. When I asked if he would do it all over again he was quick to point out that if he were a young man again he would, "get into newspaper work in some way". Barney Hubbs died January 7, 1993 in Pecos. "If men could only learn from history, what lessons it might teach us! But passion and party blind our eyes and the light which experience gives is a lantern on the stern that shines only on the waves behind us." Dunno if this will lead to anything but who knows? I am writing from Luxembourg but my mothers family (Brown) is from Florida. I was wondering if there is any information about the Natchez native American tribe coming to / passing by / Brownsville Texas OR if there is any written evidence that the Natchez tribe has ever been present in Texas at all. Family stories go that my ancestors where kidnapped/adopted by Natchez Indians who had raided their village and killed their parents when they where still children. gray Brown married to Rachel Moody they where apparently massacred by indians. Now the parents of one of these two supposedly came from Louisiana. One of the orphan children was James Minor Brown. He died 1929 in Florida after he'd been hit by a truck. James Minor Brown marrie Winci Deer Brown (half or part Indian) from Mississippi. Married in Louisiana or Mississippi at age 13 and one of the children they had Fred Allen Brown (my great-grand-father)was born in Waco Texas 1888. Some of them married and stayed within the tribe, others left it at around the age of 14/15. They did not know there surname for certain, but knew that they had been taken out of Brownsville Texas and therefor called them selves Brown. By that time they had wandered over the "Natchez trail" (i think). I'd be thankful for ANY information! Grant Foreman says in his book "The Five Civilized Tribes: Cherokee, Chickasaw, Choctaw, Creek, Seminole" on p. 184 of the Nachees as he called them, "few remain; they still however as well as the rest retain their original tongue. There are many others, but they are now entirely extinct, and even their names are forgotten. The members of these tribes possess all the privileges and immunities of Creek citizens." Here is another interesting reference to the Natchez from the Handbook of Texas that might shed some light on your research. Hope this helps and good luck with your research. We have a copy of an old journal laying around the WTHA office with a cover that has provoked conversation over the years. The journal is "Studies in History" volume 1, 1971 and it was published by Texas Tech University History Graduate Students. 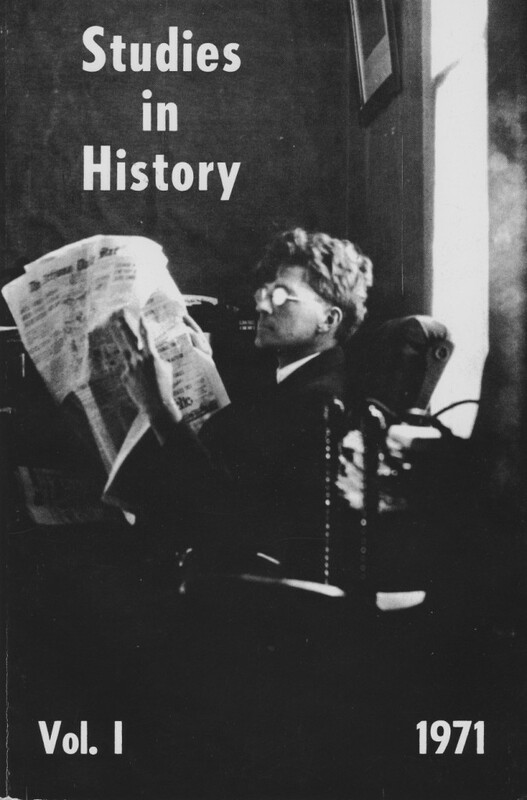 The cover features a man sitting in a chair reading a news paper. Can anyone identify it? The journal was edited by illustrious folks such as David Gracy and Earl Elam. While the photograph was referenced to the Southwest Collection archives, no one there recognizes it. If you have an answer please contact us. Boyd Cornick and side to side comparison with mystery photo. The mystery may be solved we believe. After following up on the clue provided by David Gracy and going through the Boyd Cornick Papers referenced below we did not find the exact image depicted on the cover the journal "Studies in History", but we did find two images that show a person who looks very similar. 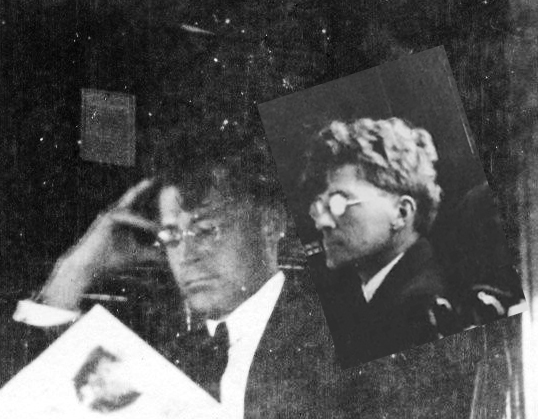 In summary, most folks thought the person was Trotsky. Some thought seriously and some jokingly that it was Lyle Lovett. One thought it was Louis Brandeis, or similar to. Another said that it was Paul Carlson. One said that it was Curry Holden. The mystery may be solved we believe. After following up on the clue provided by David Gracy and going through the Boyd Cornick Papers referenced below we did not find the exact image depicted on the cover the journal "Studies in History", but we did find two images that show a person who looks very similar. Includes correspondence, legal and financial material, medical records and journals, literary productions, printed and scrapbook material, photographs, diaries, and a genealogy of the Boyd Cornick Family. The collection bulks (1878-1964) with individual family members' correspondence. Items of note include a weather diary (1928-1933), materials on the American Relief Administration in Russia (1921-1922), the Red Cross-YMCA Mission to Paris (1919), the Civil War in Tennessee, Texas politics, the establishment of Texas Technological College, mining and banking in Mexico, and the Women's Missionary Society of San Angelo (1907-1918). Cornick, born in 1856, became a specialist in the treatment of tuberculosis. He moved to San Angelo, Texas, in 1891 after he contracted the disease himself. 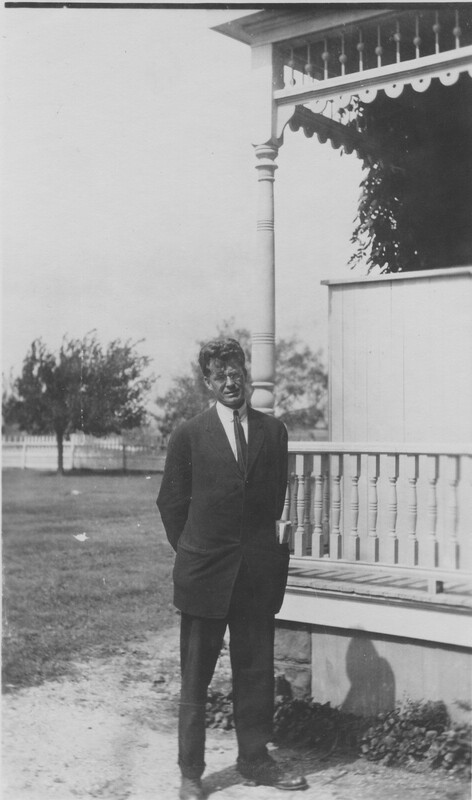 After his recovery from tuberculosis, Cornick organized a tuberculosis clinic, became active in state and local medical associations, and served on the Texas State Board of Health. He and his wife, Louise, had five children. Cornick died in 1933. Take a look and see if you think we are correct. Because you've published items on Nate Fuller and A.G. Beard in your blog over the past couple of years, I thought you might enjoy the attached photograph of Fuller (left) and Beard pretending (?) to slake their thirst in an undated picture. My nephew, Caleb who lives in West Texas thinks he's identified (the photo as being made at Livingstons's Ranch Supply in Marfa). As for the date, it would have to be sometime between mid 1916 when Beard and Fuller enlisted and 1920 when Beard left for Mexico. Obviously if you or anyone else could supply additional information it would be welcome. In November 2008, sixth-grade reading teacher Cinnamon Carter challenged her students to investigate the history of Native Americans in their small West Texas community of Ballinger. Carter, a relative newcomer to the town, was surprised to learn that many of the students had collected photos and recollections of a long-lost Indian statue that had once graced a local park. 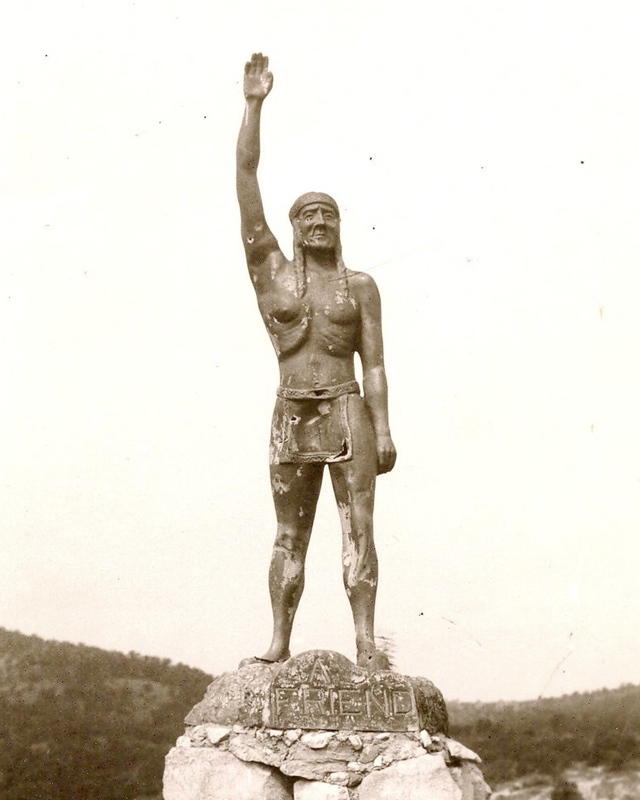 For nearly 20 years, "Chief Palacine" stood on Indian Hill in the Ballinger City Park. Ballinger city official Elmer Shepperd purchased the statue from the Wirt-Franklin Oil and Gas Refinery in Ardmore, Oklahoma, in 1939. According to Shepperd's nephew, the Ballinger statue was one of two from a Wirt-Franklin gas station at the southeast corner of Main and D Street Southwest in Ardmore. 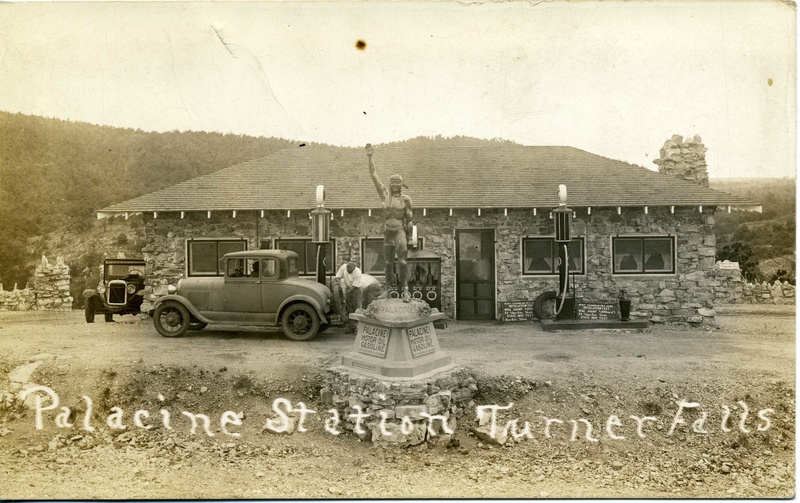 One statue was mounted atop the station and the other stood on a pedestal out front. According to National Petroleum News (April 24, 1929), the Indian statues were an advertising ploy developed by D. A. Corcoran, head of Wirt-Franklin's sales department. In order to get one of the 11 1/2-foot statues, gas station owners had to carry Wirt-Franklin's Palacine gasoline and oil brands exclusively. The cast zinc-alloy statues, produced for about $200 each by a Dallas sign company, depicted an Indian chief standing with one hand raised in a gesture of friendship. He stood on a cast metal "rock" over the words "A Friend." The base displayed the words "Palacine - Motor Oil - Gasoline" on three sides. While no one knows exactly how many statues remain, three have been on display since 1935 at Woolaroc Ranch, former home of Frank Phillips of Phillips Petroleum, in Barnsdall, Oklahoma. A Wirt-Franklin employee named Eubanks reportedly hauled off 15 statues on Mr. Wirt's orders, around 1952, and buried them in a ditch beside his house on Hedges Road, southwest of Ardmore. The statue in Ballinger was stolen by vandals sometime in the 1950s. Legend has it that the chief was thrown into the creek below Indian Hill "and never seen again." Carter's sixth-grade class became fascinated by the Indian and the place that it held in their community's collective memory. Family and wedding photos were often taken with "Friend," and one woman said, "He was the holder of our secrets, because we knew he would never tell a soul." 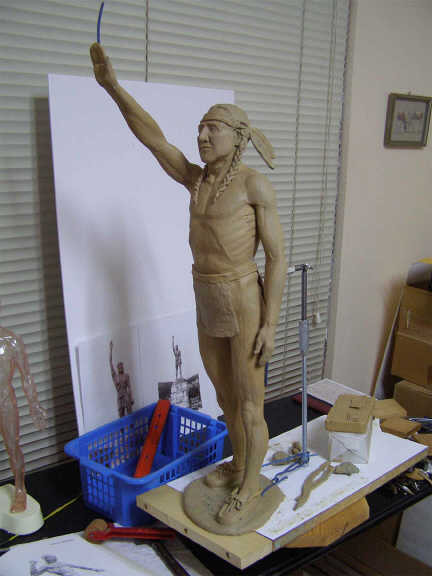 Carter, who recently established the non-profit Friends of Ballinger Indian Statue to raise money for the project, reports that the City Council, civic groups, and many individuals support the placement of a new Friend statue in the Ballinger Park. Since January 2009, the students and the "Friends of Friend" have raised $14,000 of the estimated $47,000 needed to commission a bronze replica of Chief Palacine. The statue is being created by local sculptor Hugh Campbell, who specializes in Western art, and it will be cast in bronze by House Bronze, a custom fine art foundry in Lubbock. If you would like to contribute to the project, please send your tax-deductible gift to Friends of the Ballinger Indian Statue, P. O. Box 231, Ballinger, Texas, 76821.